We are back for yet another series of carp fishing tournaments from September 1 through December 31, 2018 at the DesPlaines River in Joliet, Illinois! Entry fees have been reduced for this Fall 2018 Series: $15 for main tournament, $5 for optional Most-Carp Contest. I have tried to avoid any conflicts wth other Midwest events. If a conflict occurs, I will reconsider dates; but, at this point in time, I will apply for tournament approval to the Illinois Department of Natural Resources for carp tournaments that are scheduled on the dates that follow. 3. “Autumn Colors” Big 4 Carp Tournament - Saturday, October 27, 2018; Bicentennial Park and surrounding locations, Joliet, IL -- 7:30 a.m. until 4:30 p.m. with a 6:30 a.m. peg choice. 4. “Honor the Vets” Big 4 Carp Tournament - Saturday, November 10, 2018; Bicentennial Park and surrounding locations, Joliet, IL -- 7:00 a.m. until 4:00 p.m. with a 6:00 a.m. peg choice. 5. 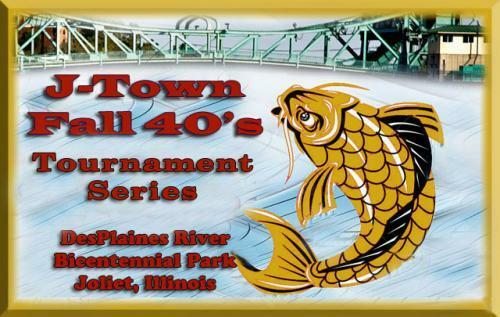 “12th Annual Paul Wells Memorial - Thanksgiving Weekend” Big 4 Carp Tournament - Saturday, November 24, 2018; Bicentennial Park and surrounding locations, Joliet, IL -- 7:00 a.m. until 4:00 p.m. with a 6:00 a.m. peg choice. 6. “Sam Snow Memorial - Let it Snow” Big 8 Carp Team Tournament - Saturday, December 8, 2018; Bicentennial Park and surrounding locations, Joliet, IL -- 7:30 a.m. until 3:30 p.m. with a 6:30 a.m. peg choice. 7. “Midnight Madness - CAG FFF” Big 6 Carp Team Tournament - Monday, December 31, 2018 through Tuesday, January 1, 2019; Bicentennial Park and surrounding locations, Joliet, IL -- 11:00 p.m. until 7:00 a.m. with a 10:00 p.m. peg choice.